I think Peter Green’s heartbreaking guitar solo at the end of “Love That Burns” is the most important moment in modern music; that Robert Johnson was a better poet than T.S. Eliot; and that Sonny Boy Williamson was as great a musician as Vladimir Horowitz. That’s it. No arguments. If you don’t agree, tough. When that old hellhound is slobbering and baying on his trail, when the devil’s got him jumping at shad­ows, a man needs to hear some three-chord. And in the South Bay, I’m talking JJ.’s. I’d never been to JJ.’s. Back when I was a Santa Clara boy forking over all my spare change to the Jesuits and working on the loading dock of a fabric store down the street, JJ.’s was a biker bar. As part of my personal philosophy is “Never drink at a place that has 43 chopped Harley-Davidsons lined up out front,” I didn’t make the joint a regular hang-out. But when Johnny said “the blues,” that changed everything. I’d walk smiling into the fiery face of perdition to hear the blues. Happily, I didn’t have to. The name is still JJ.’s Lounge but the ownership has changed. It now belongs to June Stanley, helped by her brother Max (they kept the name, she says, because by coincidence her son is named Jimmy Joseph). In front of the bandstand there are about 40 folding chairs set up, all of them filled with everyone from men in suits to blue-collar workers to one worn-looking dude in a straw cowboy hat and a black guy in a wide hat with a fluffy foxtail hanging down his back. (“We get college kids, Mercedes-and-Jaguar types from Saratoga, and Los Gatos, retired people who’ve followed the blues all their life — even foreign students and European tourists wanting to see what it’s all about,” screams Max). . In the postage stamp-sized dance area in front of the seats, a Tom Cruise clone in rugby shirt and Ray Bans is dancing with a similarly attired girl. Behind us, at an ever-running popcorn machine, a waitress in a slit skirt and shiny silk stockings is filling up bowls to hand out to customers. On fee wall across from me are stacked boxes of Budweiser bottles. “I’ve always loved the blues,” yells Max. “I used to travel all the way to Oakland to listen to it. Driving home at 2 a.m. got to be a real bear. Then my sister got divorced and wanted to open a little bar. 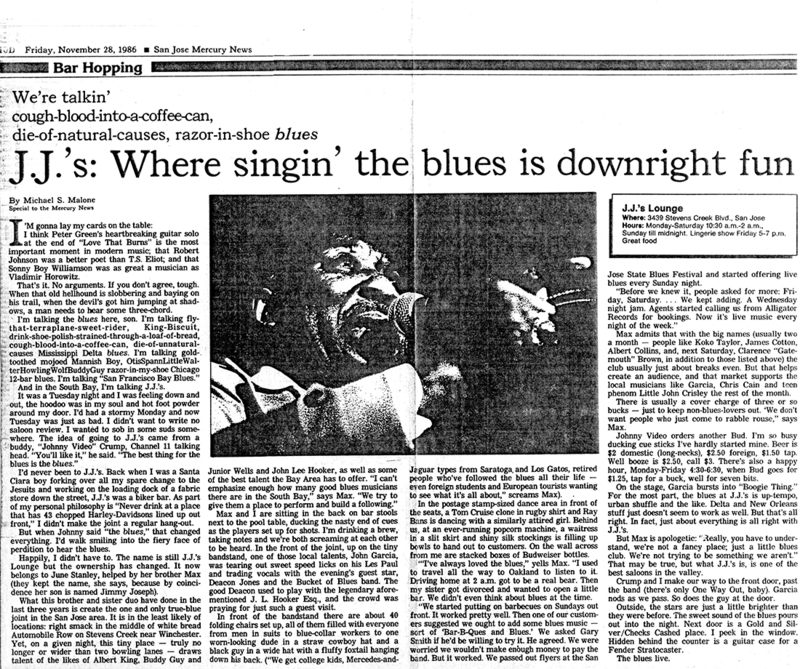 We didn’t even think about blues at the time. “We started putting on barbecues on Sundays out front. It worked pretty well. Then one of our customers suggested we ought to add some blues music — sort of ‘Bar-B-Ques and Blues.’ We asked Gary Smith if he’d be willing to try it. He agreed. We were worried we wouldn’t make enough money to pay the band. But it worked. We passed out flyers at the San Jose State Blues Festival and started offering live blues every Sunday night. Max admits that with the big names (usually two a month — people like Koko Taylor, James Cotton, Albert Collins, and, next Saturday, Clarence “Gate-mouth” Brown, in addition to those listed above) the club usually just about breaks even. But that helps create an audience, and that market supports the local musicians like Garcia, Chris Cain and teen phenom Little John Crisley the rest of the month. 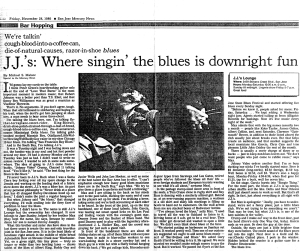 There is usually a cover charge of three or so bucks — just to keep non-blues-lovers out. ‘We don’t want people who just come to rabble rouse,” says Max. Johnny Video orders another Bud. I’m so busy ducking cue sticks I’ve hardly started mine. Beer is $2 domestic (long-necks), $2.50 foreign, $1.50 tap. Well booze is $2.50, call $3. There’s also a happy hour, Monday-Friday 4:30-6:30, when Bud goes for $1.25, tap for a buck, well for seven bits. On the stage, Garcia bursts into “Boogie Thing.” For the most part, the blues at JJ.’s is up-tempo, urban shuffle and the like. Delta and New Orleans stuff just doesn’t seem to work as well. But that’s all right. In fact, just about everything is all right with JJ.’s. But Max is apologetic:’ Really, you have to under­stand, we’re not a fancy place; just a little blues club. We’re not trying to be something we aren’t.” That may be true, but what JJ.’s is, is one of the best saloons in the valley. Crump and I make our way to the front door, past the band (there’s only One Way Out, baby). Garcia nods as we pass. So does the guy at the door. Outside, the stars are just a little brighter than they were before. The sweet sound of the blues pours out into the night. Next door is a Gold and Sil­ver/Checks Cashed place. I peek in the window. Hidden behind the counter is a guitar case for a Fender Stratocaster.